Under stringent quality checks we deliver precision quality Weather Stations that consist of a weather-proof enclosure containing the data logger, rechargeable battery and the meteorological sensors with an attached solar panel or wind turbine. The specific configuration may vary due to the purpose of the system. 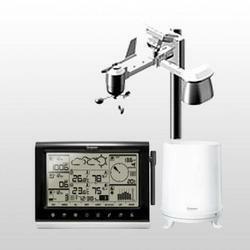 These weather stations come with radio controlled wireless clock and a LCD display.